Peanut Proud, Inc. unites the peanut community. Peanut Proud is a non-profit organization, created in the wake of an unfortunate peanut recall which threatened to damage the reputation of the entire peanut producing southwest Georgia area. Communities rallied together to celebrate their commitment to peanut production despite one company’s mistake. Since then Peanut Proud has joined in a number of humanitarian efforts and has been recognized as a leader in the region. Peanut Proud, Inc. holds a peanut festival (link: 5.J.b.) in Blakely, Georgia each year. Activities include everything from sports competition to a parade and beauty pageant. It also sponsors an annual $2,000 scholarship that recognizes outstanding students in the many academic fields that the peanut industry is reliant upon. Early County 2055 executive director leads humanitarian effort for Haiti. 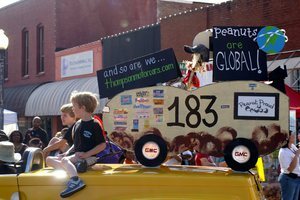 In 2010, Peanut Proud participated in an international project, Peanut Butter for Haiti. The initiative was inspired and led by Early County 2055 Executive Director, Barton Rice, who stepped forward with the first financial pledge to deliver peanut butter to the victims of earthquake ravaged Haiti. Haiti receives relief thanks to Early County Leaders. Following Rice’s lead, the peanut industry, community leaders and organizations in surrounding states joined the effort. The project resulted in over $350,000 worth of donated peanut butter shipped to Haiti. Victims received about 260,000 pounds of peanut butter and peanut products, the equivalent of more than 3,600,000 servings. Area Peanut History is cherished. Early County has a long and proud relationship with the peanut. Peanut farming in the county and southwest Georgia historically has been a fundamental part of the area economy. Early County, which is the largest peanut quota holding county in the nation, touts this crop's importance with its own peanut statue on Courthouse Square in Blakely.